GUANTANAMO BAY, CUBA - (@The Comedy News) - The elusive world-traveler and suspected terrorist known only to the public as "Waldo" has been caught, and is currently being held without trial at Guantanamo Bay detention camp in Cuba. 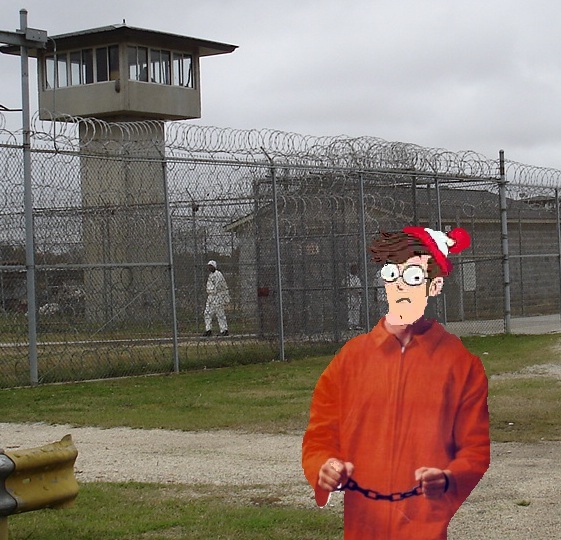 "I can confirm that Waldo is joining other suspected terrorists at Gitmo Bay prison," according to a cell block guard, speaking on the condition of anonymity. "Waldo was apprehended in a covert operation earlier this month while attempting to photo-bomb a Swedish newlywed couple at the Great Wall of China." Waldo has been a prime-suspect in photo-bombing on every continent in the world dating back to 1987. He frequently went to crowded events, and openly sought to photo-bomb other gatherers. He had been described as 6'4", thin, left handed, and walks with a cane. Facebook friends of Waldo noted that while on the run, Waldo was likely to be connected to a dialysis as well. Other prisoners at Guantanamo Bay prison have reported seeing guards tormenting Waldo. There have been reports that guards have abused Waldo's prized travel journal including flushing pages of his journal down the toilet, defacing his journal, writing comments and remarks on his journal, tearing pages out of his journal, and denying Waldo possession of his journal altogether. Human rights groups around the world are getting ready to hold protests in support of getting Waldo a fair trial. Waldo has requested that his legal counsel include Academy Award-winning actor Joe Pesci.